An infectious disease, due to the entrance of the tubercle bacillus into the body. The question of the relative infrequency of consumption among Jews has engaged much attention among physicians and anthropologists. It is well known that dwellers in large cities, particularly those living in crowded and insufficiently ventilated tenement-houses, are generally the first victims of the tubercle bacillus. Tailoring and other sedentary occupations that are favored by Jews tend to raise the percentage of tuberculous patients. Consanguineous marriages, common among Jews, are also a predisposing cause of this disease. Accordingly, the Jews, particularly those residing in the congested tenement districts of large modern cities, like New York, London, Vienna, Odessa, etc., suffer from this disease more than others. In fact, the appearance of many a modern Jew would immediately lead one to suspect the presence of tuberculosis. He is more stunted in growth than almost any other European. According to the statistics given by Jacobs (see Anthropology),"the average height of the Jews is 162.1 cm. [5 ft. 3 in. ]; span of arms, 169.1 cm. [5 ft. 6⅗ in. ]; and girth around the chest, about 81 cm. [31.9 in. ]: so that they are the shortest and narrowest of Europeans." The exceptionally narrow girth of Jews gives them what is technically known as the lowest "index of vitality." The Jews are also town-dwellers; four-fifths of the Jewish populations live in large towns, while only one-third of the non-Jewish populations live in cities. 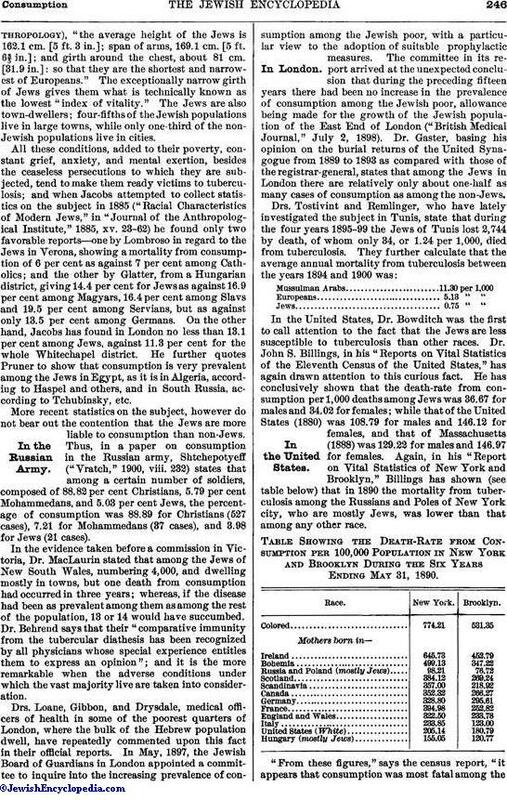 All these conditions, added to their poverty, constant grief, anxiety, and mental exertion, besides the ceaseless persecutions to which they are subjected, tend to make them ready victims to tuberculosis; and when Jacobs attempted to collect statistics on the subject in 1885 ("Racial Characteristics of Modern Jews," in "Journal of the Anthropological Institute," 1885, xv. 23-62) he found only two favorable reports—one by Lombroso in regard to the Jews in Verona, showing a mortality from consumption of 6 per cent as against 7 per cent among Catholics; and the other by Glatter, from a Hungarian district, giving 14.4 per cent for Jews as against 16.9 per cent among Magyars, 16.4 per cent among Slavs and 19.5 per cent among Servians, but as against only 13.5 per cent among Germans. On the other hand, Jacobs has found in London no less than 13.1 per cent among Jews, against 11.3 per cent for the whole Whitechapel district. He further quotes Pruner to show that consumption is very prevalent among the Jews in Egypt, as it is in Algeria, according to Haspel and others, and in South Russia, according to Tchubinsky, etc. More recent statistics on the subject, however do not bear out the contention that the Jews are more liable to consumption than non-Jews. Thus, in a paper on consumption in the Russian army, Shtchepotyeff ("Vratch," 1900, viii. 232) states that among a certain number of soldiers, composed of 88.82 per cent Christians, 5.79 per cent Mohammedans, and 5.03 per cent Jews, the percentage of consumption was 88.89 for Christians (527 cases), 7.21 for Mohammedans (37 cases), and 3.98 for Jews (21 cases). In the evidence taken before a commission in Victoria, Dr. MacLaurin stated that among the Jews of New South Wales, numbering 4,000, and dwelling mostly in towns, but one death from consumption had occurred in three years; whereas, if the disease had been as prevalent among them as among the rest of the population, 13 or 14 would have succumbed. Dr. Behrend says that their "comparative immunity from the tubercular diathesis has been recognized by all physicians whose special experience entitles them to express an opinion"; and it is the more remarkable when the adverse conditions under which the vast majority live are taken into consideration. Drs. Loane, Gibbon, and Drysdale, medical officers of health in some of the poorest quarters of London, where the bulk of the Hebrew population dwell, have repeatedly commented upon this fact in their official reports. In May, 1897, the Jewish Board of Guardians in London appointed a committee to inquire into the increasing prevalence of consumption among the Jewish poor, with a particular view to the adoption of suitable prophylactic measures. 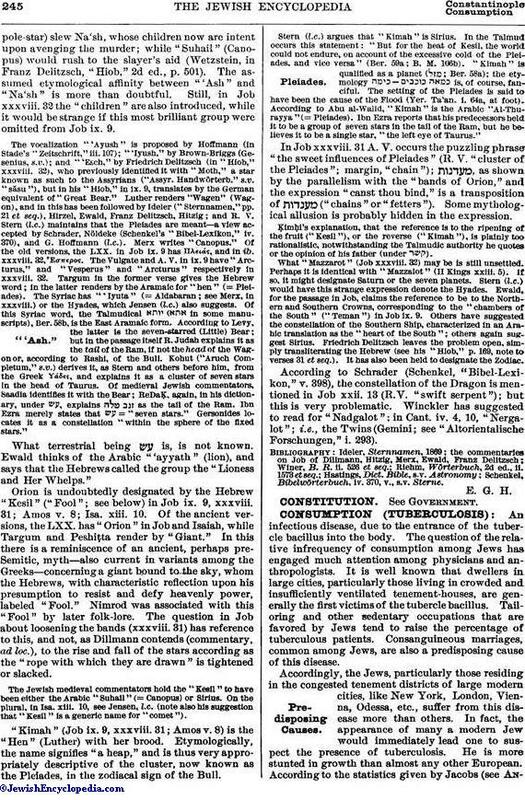 The committee in its report arrived at the unexpected conclusion that during the preceding fifteen years there had been no increase in the prevalence of consumption among the Jewish poor, allowance being made for the growth of the Jewish population of the East End of London ("British Medical Journal," July 2, 1898). Dr. Gaster, basing his opinion on the burial returns of the United Synagogue from 1889 to 1893 as compared with those of the registrar-general, states that among the Jews in London there are relatively only about one-half as many cases of consumption as among the non-Jews. In the United States, Dr. Bowditch was the first to call attention to the fact that the Jews are less susceptible to tuberculosis than other races. Dr. John S. Billings, in his "Reports on Vital Statistics of the Eleventh Census of the United States," has again drawn attention to this curious fact. He has conclusively shown that the death-rate from consumption per 1,000 deaths among Jews was 36.67 for males and 34.02 for females; while that of the United States (1880) was 108.79 for males and 146.12 for females, and that of Massachusetts (1888) was 129.22 for males and 146.97 for females. Again, in his "Report on Vital Statistics of New York and Brooklyn," Billings has shown (see table below) that in 1890 the mortality from tuberculosis among the Russians and Poles of New York city, who are mostly Jews, was lower than that among any other race. Table Showing the Death-Rate from Consumption per 100,000 Population in New York and Brooklyn During the Six Years Ending May 31, 1890. "From these figures," says the census report, "it appears that consumption was most fatal among thecolored, the Irish, and the Bohemians, and least fatal among the Russians and Hungarians; that is to say, among the Jews." These statistics were objected to by some, on the ground that many of those registered by the census officials as Russians or as Poles, were not Jews, but Catholics. In order to test the validity of the figures, Dr. Maurice Fishberg has collected statistics of the mortality from consumption in the New York ghetto. By computing the mortality from this disease in each ward, approximately correct figures were easily obtained. The reports of the board of health of New York show that during the three years 1897, 1898, and 1899 there occurred 119,226 deaths from all causes, and of these, in the boroughs of Manhattan and the Bronx, 15,038 were due to tuberculosis. Of these the proportion for each of the wards in the section of the city below Fourteenth street is indicated in the accompanying map. 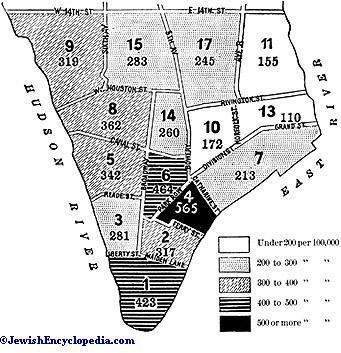 The average mortality from tuberculosis in the seventh, tenth, eleventh, and thirteenth wards (the Jewish wards) was 162.99 per 100,000 population for the three years 1897, 1898, 1899, while the average for Manhattan and the Bronx was 268.19; while in Manhattan and the Bronx during these three years the deaths due to tuberculosis amounted proportionately to 126 per 1,000 deaths; as is shown by the figures recorded above, in the four Jewish districts referred to the total number of deaths from tuberculosis was 1,419—that is, 99 per 1,000 deaths. Consumption is undoubtedly on the increase among the poorer classes of Jews living in New York city. Dr. Lee K. Frankel, manager of the United Hebrew Charities, has shown that while in 1895 the ratio of consumptive applicants for relief was 2 per cent, in 1899 it reached 3 per cent, an appalling increase of 50 per cent in four years. Frankel also shows that consumption among the Jews in New York is almost wholly confined to the poorer classes, and that foreign-born Jews who suffer from this disease have contracted it after their arrival in the United States. He bases his deduction on an examination of 10,000 death certificates in the office of the New York City Board of Health, beginning with Jan. 1, 1900. In 888 of these the cause of death was stated to be tuberculosis, 72 relating to Jews. 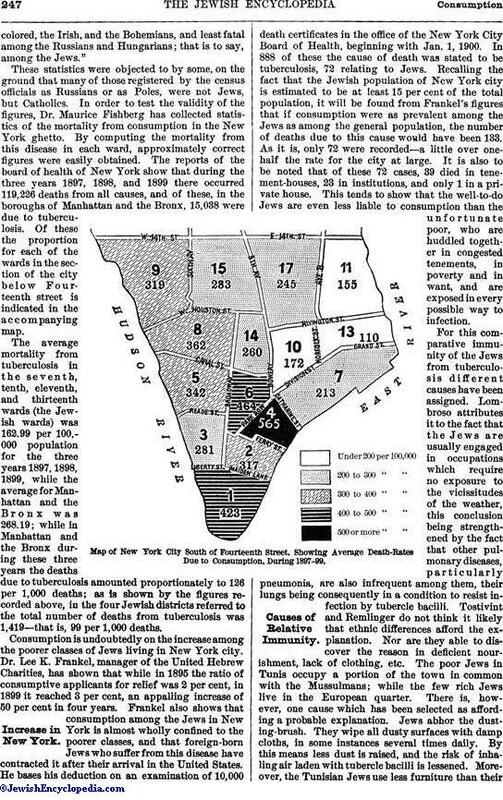 Recalling the fact that the Jewish population of New York city is estimated to be at least 15 per cent of the total population, it will be found from Frankel's figures that if consumption were as prevalent among the Jews as among the general population, the number of deaths due to this cause would have been 133. As it is, only 72 were recorded—a little over one-half the rate for the city at large. It is also to be noted that of these 72 cases, 39 died in tenement-houses, 23 in institutions, and only 1 in a private house. This tends to show that the well-to-do Jews are even less liable to consumption than the unfortunate poor, who are huddled together in congested tenements, in poverty and in want, and are exposed in every possible way to infection. Map of New York City South of Fourteenth Street, Showing Average Death-Rates Due to Consumption, During 1897-99. For this comparative immunity of the Jews from tuberculosis different causes have been assigned. 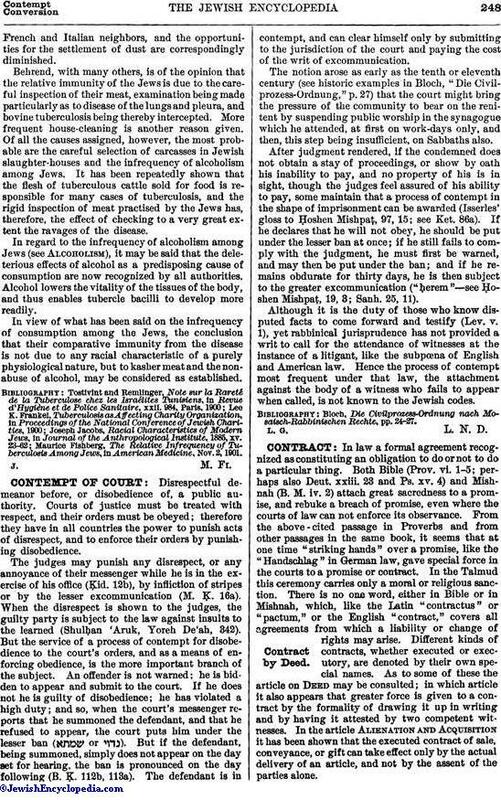 Lombroso attributes it to the fact that the Jews are usually engaged in occupations which require no exposure to the vicissitudes of the weather, this conclusion being strengthened by the fact that other pulmonary diseases, particularly pneumonia, are also infrequent among them, their lungs being consequently in a condition to resist infection by tubercle bacilli. Tostivint and Remlinger do not think it likely that ethnic differences afford the explanation. Nor are they able to discover the reason in deficient nourishment, lack of clothing, etc. The poor Jews in Tunis occupy a portion of the town in common with the Mussulmans; while the few rich Jews live in the European quarter. There is, however, one cause which has been selected as affording a probable explanation. Jews abhor the dusting-brush. They wipe all dusty surfaces with damp cloths, in some instances several times daily. By this means less dust is raised, and the risk of inhaling air laden with tubercle bacilli is lessened. Moreover, the Tunisian Jews use less furniture than theirFrench and Italian neighbors, and the opportunities for the settlement of dust are correspondingly diminished. Behrend, with many others, is of the opinion that the relative immunity of the Jews is due to the careful inspection of their meat, examination being made particularly as to disease of the lungs and pleura, and bovine tuberculosis being thereby intercepted. More frequent house-cleaning is another reason given. Of all the causes assigned, however, the most probable are the careful selection of carcasses in Jewish slaughter-houses and the infrequency of alcoholism among Jews. It has been repeatedly shown that the flesh of tuberculous cattle sold for food is responsible for many cases of tuberculosis, and the rigid inspection of meat practised by the Jews has, therefore, the effect of checking to a very great extent the ravages of the disease. In regard to the infrequency of alcoholism among Jews (see Alcoholism), it may be said that the deleterious effects of alcohol as a predisposing cause of consumption are now recognized by all authorities. Alcohol lowers the vitality of the tissues of the body, and thus enables tubercle bacilli to develop more readily. In view of what has been said on the infrequency of consumption among the Jews, the conclusion that their comparative immunity from the disease is not due to any racial characteristic of a purely physiological nature, but to kasher meat and the nonabuse of alcohol, may be considered as established. Maurice Fishberg, The Relative Infrequency of Tuberculosis Among Jews, in American Medicine, Nov.2, 1901.